Here’s another holiday menu post! I do want to start by apologizing for some of my pics. When I was doing my Winter Feast, I was so concerned with keeping to my schedule and feeding hungry guests, I forgot to take pictures of the finished products 😦 Like the Savory Bread Pudding, the Rapini with Fried Apples, the Biscotti, the Roasted Fennel, and this. But luckily there were some leftovers (as is the usual with large parties) and I got to take some shots. Of course, I don’t know what my excuse is for not taking pics of the cheesecake because this was made the day before. But it was evening, so natural light wasn’t available. Plus it’s been very cloudy lately which makes taking good pictures more challenging. That was the case when I was trying to take some pictures of what was left of the cheesecake (and it was raining a little bit). All the Christmas lights in the world really can’t replicate natural light. Chanukah Bear and the Christmas Turtle (or is that a Frog?) are happily sharing a piece of cheesecake. 1. Preheat oven to 375 degrees F. Spray 9-in springform with cooking spray. Pulse the graham crackers, sugar, and salt until fine. Add the crystallized ginger and chop (I like having larger bits of ginger in the crust, but you can keep everything a uniform size if you like). Drizzle in the melted butter and combine. 2. Press the crumbs into the bottom and up the sides of the pan about 1 inch. Bake for about 15 minutes until slightly browned. Allow to cool. After the pan is cool to the touch, wrap in foil to prevent water from seeping in. 1. Reduce oven to 325 degrees F. In the bowl of a mixer, beat cream cheese until fluffy using the paddle attachment. Be sure to scrape down the sides as you go along. Add sugar and salt and mix well, scraping down the sides. Add eggs one at a time, again scraping down the sides after each addition. Mix in the sour cream well. Fold in the compote. 2. Pour the batter into the prepared springform pan. Place the springform in a roasting pan; now fill the roasting pan with hot water halfway up the sides of the springform. Bake for about 90 minutes until set in the middle. If there is too much browning during baking, loosely place some foil on top of the cheesecake. 3. Allow the cake to cool on a rack. After about 15 minutes, run a knife around the edges of the cake to help release it from the pan. Let it cool completely before wrapping the top with plastic. Refrigerate for at least 6 hours, or overnight (even better)! Notes — I was hoping that this would be a little bit more pink. I guess I could always add some coloring, but I’d rather not. . . You are supposed to bake this in a water bath, but if you don’t happen to have a roasting pan you can just use a sheet pan. 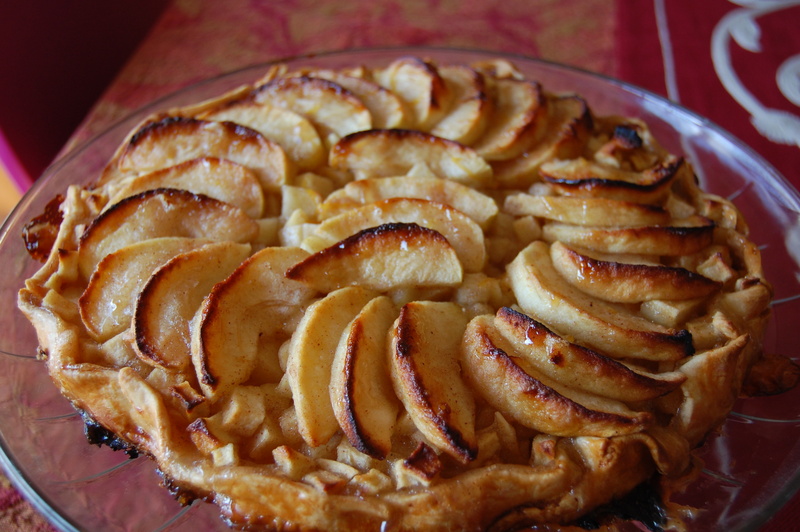 Fill the pan as high as you can with water; you will probably have to refill the pan at least once during baking. But halfway through the baking process, loosely place some foil on top of the cake. This helps trap some steam around the cake, which helps it bake. . . This entry was posted in Cakes, Desserts, Holidays, Recipe and tagged Cakes, Food, Holidays, Recipes. 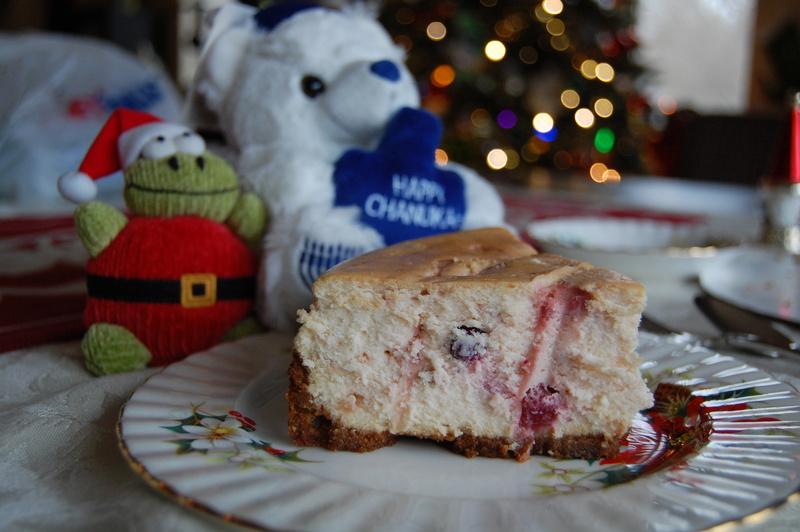 Yes cranberry cheesecake. thanks for posting and sharing. I got hungry just reading that. Great recipe! Fab idea. Seasonal and cheesecakey! Perfect. I’m still looking for cranberries to makes you compote… The last two stores didn’t have any! 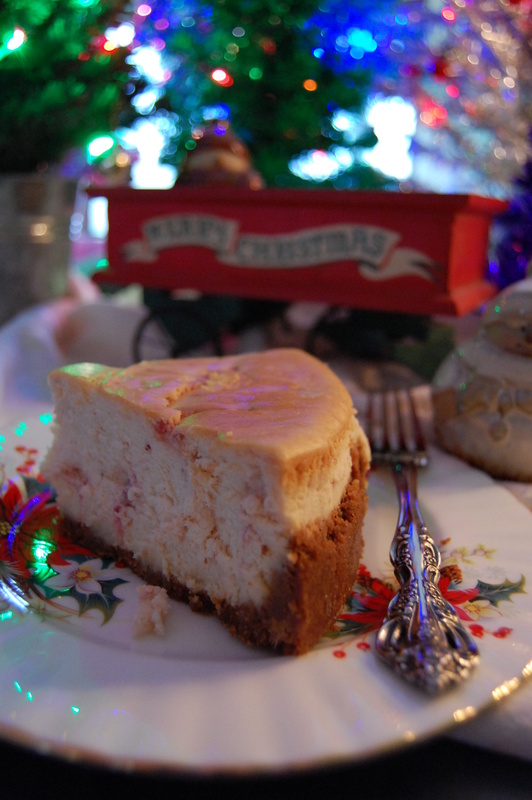 Cheesecakes make me drooooool… I’ve never been a fan of cranberry but this makes me want to give it a second chance!! i love making different flavored cheesecakes. i posted another cheesecake recipe; it was a pumpkin cheesecake with a lavender pepita croquant. you should check that one out!